Has anyone tried to use FlowHeater to parse a 835 Health Claim Remit? I am must starting to look at using FlowHeater to see how this would be done. 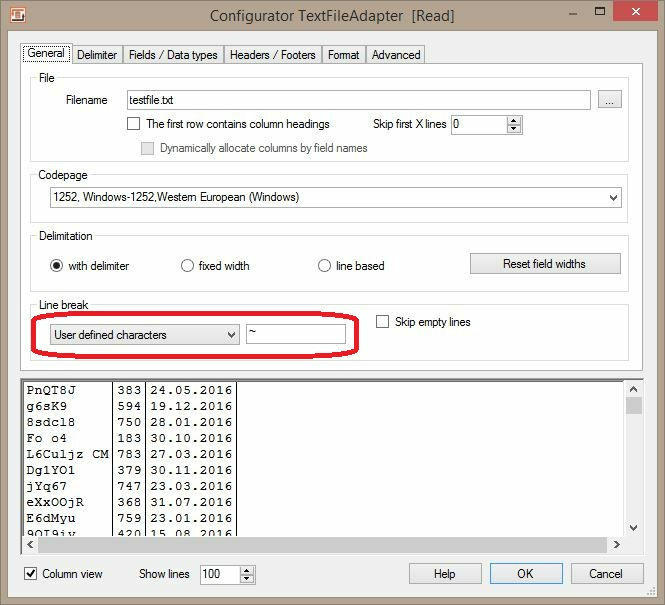 Thanks for this request Till now the TextFile Adapter just supports text files with DOS/Windows or UNIX/Linux line breaks. I’ve provided a first BETA version of FlowHeater, this version supports also user defined characters for line breaks like the screenshot below. To split sub field into several field you have to use the String Split Heater with the desired delimiter. Note: For each sub field you have to use one separate String Split Heater . In the attachment you’ll find a short example how to use it. Processing EDI files can be a hard work! But is possible. One big problem is that in one file multiple records with different structures can be occur. You have to proceed such file with different FlowHeater Definition. One Definition has to be just proceed on structure all others must be filtered out with the help of the Filter Heater . This procedure is also covered in the example. Thanks so much for quick response, beta and also examples. I will look this over and let you know how i do. Thanks again and i will keep you updated on my progress. I am working with your Beta and examples and will keep you posted on my progress.